Well hello guys once again it's me! Sorry if I've been slow recently with walls it's because I have a job now and I don't really have much inspiration as I used to...until I finished Steins; Gate. 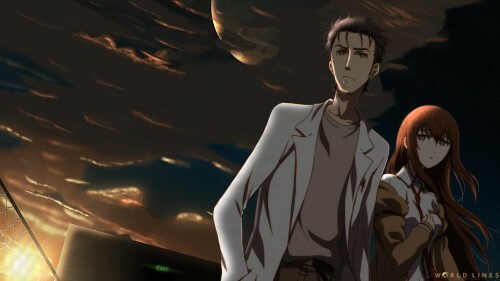 I'm happy how the show ended and I think Okabe is the best Male character in an anime in history (yes history I think that anyways). I edited the scan I got from Here :). Took some cloning to finish the spots where Makise's hand was as well as Okabe's lab coat. I've been rusty when it comes to that so I hope it's not too obvious haha. Same goes with extracting and the overall wallpaper. I took some good thought going back and forth with the cloud design until I was finally satisfied. Same with the perspective, GOD I can't do it if my life depended on it haha. Lighting took a while to get it down and the shadowing was simple for me. Really Thanks For sharing!..I love this couple! exelent piece of work! thanks for sharring it, Kyouma looks so cool with Christiiina there! I really love this wallpaper. I think you really captured the theme and main feelings from this amazing series. It have the dark tone of the series, but at the very same time, the light and the hope from the last episodes. Thanks for sharing this wonder ;) !